The purpose of the zebra’s unique fur colour has not been entirely clarified. It does seem to work as camouflage against predators, but only in certain circumstances. Let yourself be enchanted by the striking stripe pattern of the zebras in our handmade acrylic paintings. The colour combination of black and white not only accentuates zebra motifs, but also achieves a unique effect in abstract oil paintings in large format. Zebras wear these colours from the top of their ears to the tip of their tails — but are they white with black stripes or black with white stripes? That’s a matter of opinion. What is clear, though, is that no stripe is like the next. Just as no two zebras look the same, all of our KunstLoft paintings are one-of-a-kind pieces of art. Africa is the second largest continent on earth and is well known for its incredible flora and fauna as well as countless national parks. The zebra lives in herds in the African Savanna. During the dry season, zebra herds retreat to better pastures. Bring a piece of Africa into your living room with our paintings and explore the vastness of the African steppes from the comfort of your sofa. As diverse as this part of the world is with its massive deserts and impressive coastlines, so too are the colourful and varied acrylic paintings from KunstLoft. Our paintings are hand picked to amaze you and your guests every day. 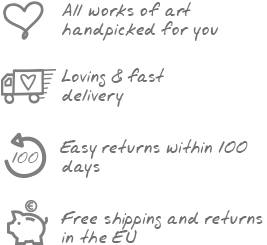 The choice is all yours: At KunstLoft you will find handmade acrylic paintings in various sizes and styles. Find the painting that will turn your world upside down! Black and white stripes trot through the endless steppe landscape. The zebra looks around gracefully and immediately draws your attention as the subject of a wall painting. Go on a safari through the wilderness of Africa in your office or living room. Your visitors will be delighted by this visualised journey to the south.